baby girl | ... And Show Your Work! Together Tuesday: How Does Your Garden Grow? This past April, when my mother and her long-time boyfriend, Rick, came to visit us, he planted a small garden for me. It only consists of four tomato plants (2 regular, two cherry), but it is very much appreciated. I do not have what you would call a green thumb, but though they are not ripe yet (thank you, hot southern weather! ), I am pleased to report that all of the plants have fruit on them. The cherry tomatoes especially look like they are just ready to give it all up, but alas, there is no red in sight. All that being said, my garden has given me something already even though I haven’t been able to eat anything from it. When I went to go buy myself a watering can (because I am such a non-gardener that I did not possess either a watering can or a hose), I stumbled upon a tiny, child-sized watering can with Disney princesses on it. It was rated for children three and up, but I honestly couldn’t figure out why (no small parts, the hole on the top was entirely too small for her to get her hand trapped in, etc.) so I went ahead and bought it. It was only 99 cents, and I figured I could snap a cute staged picture of us in the garden and be done with it. Turns out, Baby Girl loves the watering can. She still hasn’t quite got the hang of getting to the garden before dumping it out, but she will follow me to the spigot, hold the watering can out for me to fill, and then take it with glee. We walk toward the garden, and she holds out about as long as it takes for her hand to waver, and as soon as the water starts spilling, she’s watering the ground (usually concrete. My backyard is a mess, y’all.) It’s adorable. I go water my plants and then fill up her watering can again and let her water the concrete some more. Sometimes she makes a puddle and splashes in it. I don’t always take her out to water the garden with me (sometimes I do it on the way in/out from work or while she’s taking a nap), but it is certainly fun together time when we do. What activities have you thought about involving your children in? 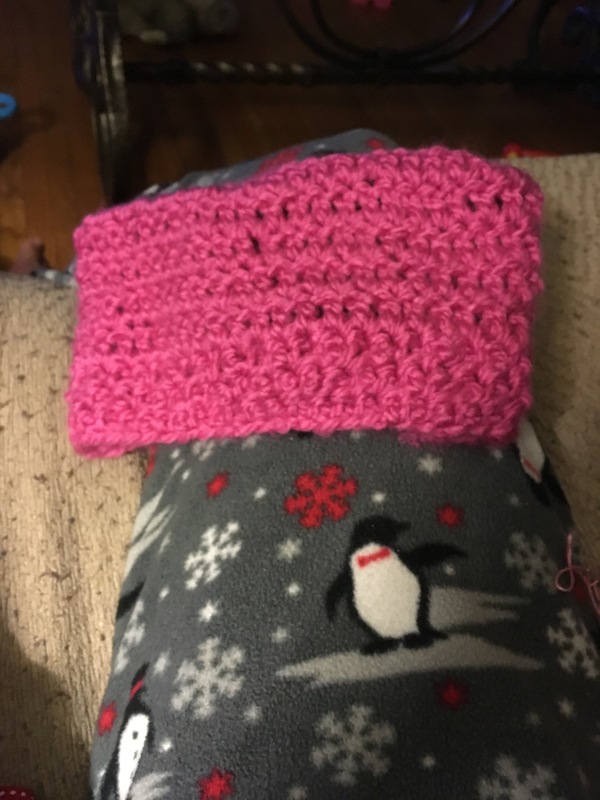 I technically finished slightly after midnight local time, but I’m going to call this a win for the day because this project has been on my mind for a long time. And it’s been a very long day. Today’s project is a nickname we have for Ana. 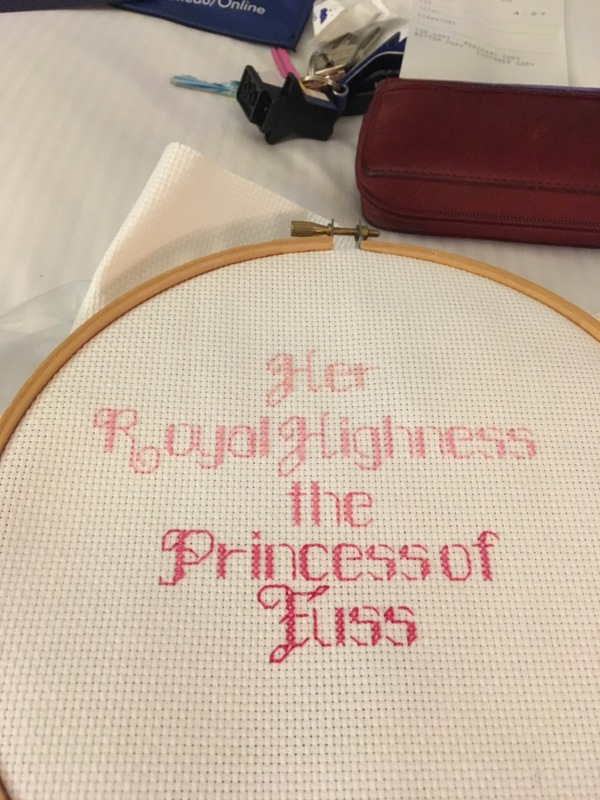 And now it’s immortalized in cross-stitch! I’ll frame it when I get home. 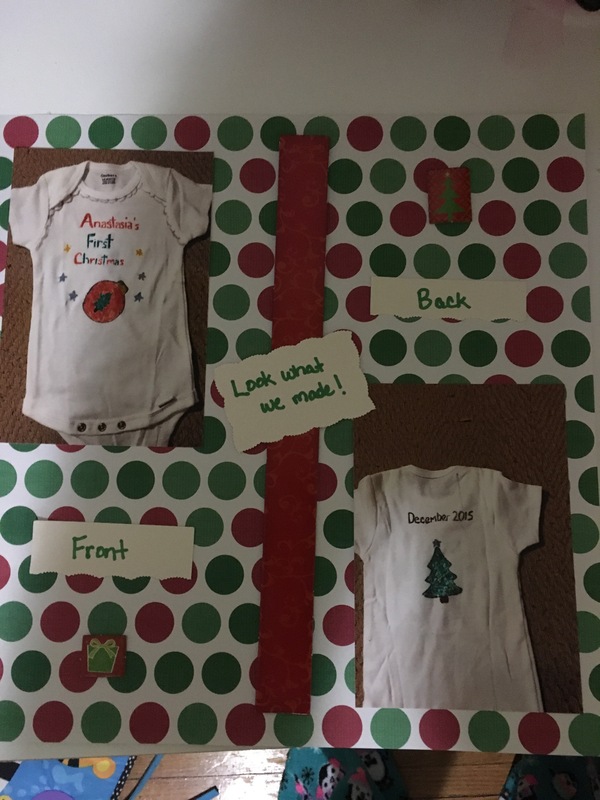 I am so excited to share the craft I did today! 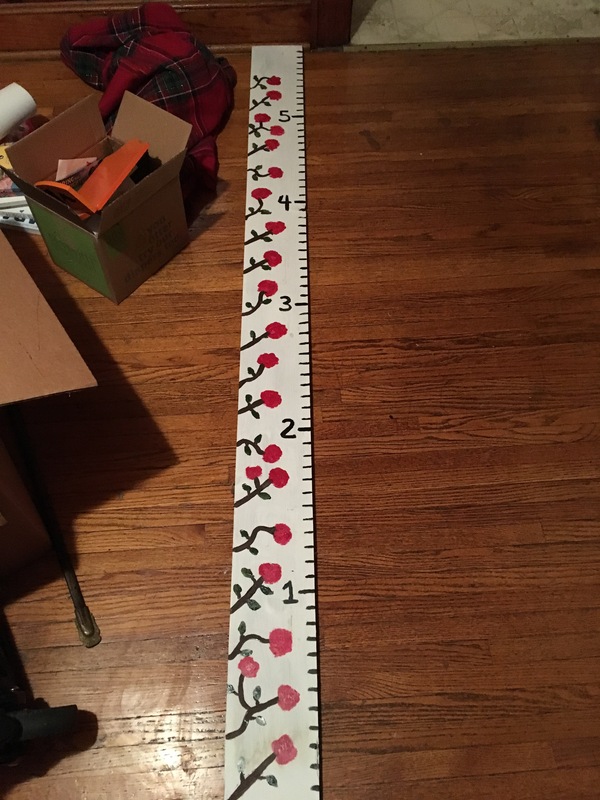 I think it definitely makes up for two days of boring scrapbook pages and it something I have meant to do for a while now: a growth chart for Ana! Only goes up to 6 feet because Rob and I are very short but I think it will be good enough for Ana. I have also thought about adding a couple of embellishments to it (her name, some definition to the flowers) but I am calling it done for now. 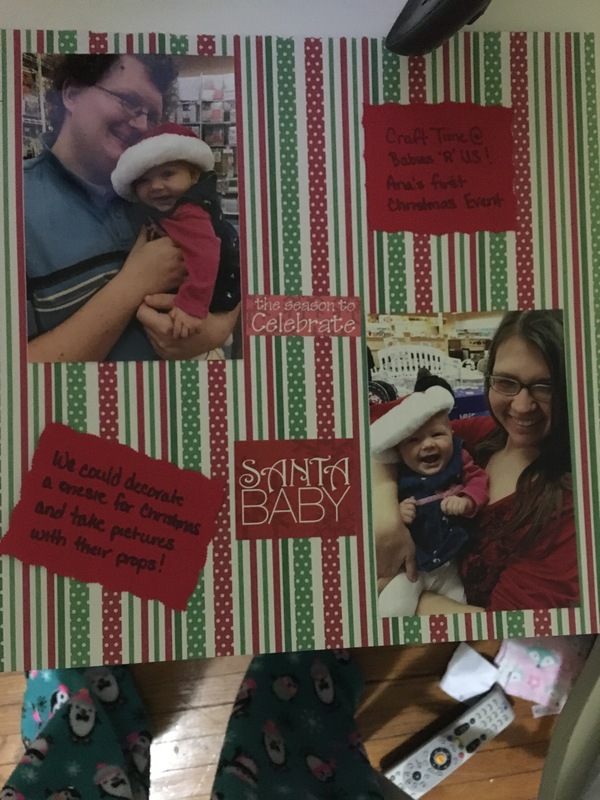 Baby Girl has been … less than sleepy all evening and I only sat down to craft at 10:45, so today’s craft is just a simple scrapbook page. I blurred the one picture for reasons that I hope are obvious. Today was rough, but I got something done! It’s a good thing I have a ton of pictures to scrapbook! Easy to do in a time crunch! I had to be an adult today and drop by work to make phone calls while Baby Girl was napping. But! I did not fail in my creativity quest! 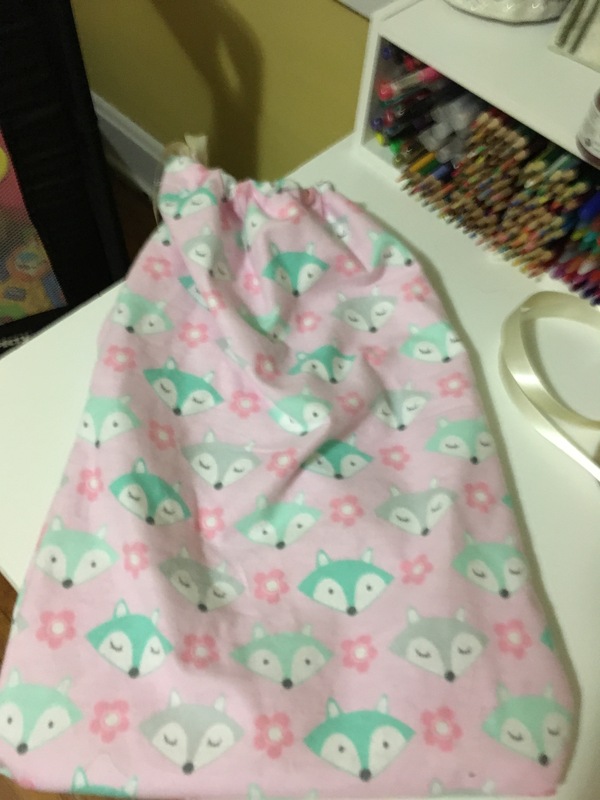 I made a little bag of holding for Baby Girl’s Little People toys which are currently scattered on the living room floor. She slept in one long nap today though, so I have no clue what tonight will bring as far as getting more free time goes. I do know that I am probably going to need more crafting supplies soon though. Or other craft ideas.